John Philpot, an international lawyer, writing in the recently published book “Justice Belied” writes how overriding selectivity of international law deprives it of legitimacy. He says discriminatory justice is not justice, and describes an international system where “selective prosecution” and the “impunity granted to major powers” undermines its credibility and efficacy. Today, the Human Rights Council’s integrity is being undermined by “selective prosecution” and the “impunity” of certain states who insist on using the UNHRC as an instrument of their foreign policy. Since its establishment in 2006 as the successor body to the disestablished Commission on Human Rights, the Human Rights Council, has a mandate to strengthen the promotion and protection of human rights, to address situations of human rights violations and make recommendations. Reconstituted as the UNHRC in 2006, the new forty-seven member body has a higher threshold for membership as well as a universal periodic review (UPR) process, which evaluates the human rights records of states, including those on the council. Unfortunately, it has not been spared the political machinations by some powers who insist on using this and other international bodies to advance their foreign policy agendas. UN Resolution 65/251 stresses that the work of the UN Human Right Council (UN HRC) shall be guided by the principles of impartiality, objectivity and non-selectivity. Sheila Keetharuth, the UN Special Rapporteur on Eritrea has undermined her credibility and integrity and her impartiality has been seriously questioned, not because of the inherent flaws in the mandate itself, but because of her past and present entanglements with anti-Eritrea elements who are obviously influencing her judgment. Such blatant affirmation of prejudice takes away from the good that Special Rapporteurs should do. States such as Eritrea can work productively with those who are concerned with Human Rights, and Human Rights only, and not those advancing a political agenda…compromising the credibility and integrity of the Human Rights regime…. As the record will show, it is not by coincidence that Sheila Keetharuth was appointed Special Rapporteur for Eritrea… as the Government of Eritrea has been her target for quite some time, and the UN Human Right Council provided the means to achieving her goals and that of her sponsors. Her background and activities against the Government of Eritrea on behalf of known anti-Eritrea political groups and individuals is a matter of public record and have been addressed ad nauseum. As the report of the Special Rapporteur and any decisions based on them, have a far-reaching impact on Eritrea and its population, it is important that it is reflective of the realities in Eritrea and not based on hearsay and innuendos and should not serve as a pretext or cover for illicit political agendas of certain quarters. There have been numerous inconsistencies and outright distortions in her previous reports; but for brevity’s sakes, the most egregious will be addressed. It should be noted that all previous attempts by the Eritrean government and Eritrean Diaspora communities to provide the Rapporteur with pertinent information on Eritrea have fallen on deaf ear. Serving as a UN Rapporteur with a he budget allocated for travel and expenses, not to mention a hefty per diem of over $650 is a lucrative endeavor, and those who claim they are doing the work for altruistic reasons are insulting the intelligence of the people they purport or claim to be defending. After two years, it is obvious from the various press statements and personal engagements with anti-Eritrea regimes and groups sponsored by them, Sheila Keetharuth, the Special Rapporteur on Eritrea is incapable of providing a credible, verifiable, impartial report on the human rights in Eritrea. The credibility and integrity of the Commission of Inquiry, of which she is a part, has been seriously compromised and its reports on Eritrea will be neither credible, nor impartial for the following 10 reasons. Whereas no report on Eritrea would be complete without the mention of the 14-year long occupation of sovereign Eritrean territories by Ethiopia, all previous reports produced by Sheila Keetharuth, a lawyer by profession, trivialize that very important issue. Her failure to adequately address and acknowledge Ethiopia’s illegal occupation of sovereign Eritrean territories and rejection of international law, as being the root cause of the issues surrounding peace, stability and security in the region today undermines, makes her selective calls for “adherence to international law”, biased and hypocritical. The sanctions resolution against the State of Eritrea also is a violation of Eritrea’s right to self-determination and Article 39- power of determination, Article 33 and Article 95-Resolution of Disputes, Article 2 and Article 51, Eritrea’s Right to Self Defense-enshrined in the United Charter. These sanctions were designed to weaken Eritrea’s economy and undermine her right to self-defense, a right protected under the UN Charter. Sheila Keetharuth calls for respect of UN Conventions and Charters in her reports on Eritrea. 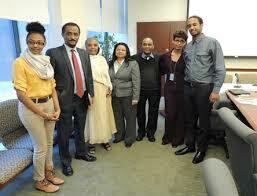 The struggle for Eritrea’s independence and freedom was a fight for the human rights of the Eritrean people. Therefore, Eritrea’s current economic and political development strategy is based on social justice which guarantees equal opportunity for all citizens, and self-reliance which calls participation of all Eritrean citizens in the post-independence reconstruction and development of the war torn nation. Eritrea’s success in achieving 7 out of 8 of the Millennium Development Goals is a direct result of these strategies designed to improve the lives of the vast majority of Eritrea’s citizens. A successful endeavor touted by many as being exemplary in Sub-Saharan Africa and yet, Sheila Keetharuth chose to undermine and neglect those facts in her reports. The methodology that Sheila Keetharuth chose to employ, the sources she chose to use collect her data as well as the scope of your report are dubious at best. Any impartial observer would have serious reservations about the primary and secondary sources she chose to use in compiling her reports. Ignoring the vast majority of Eritreans in the Diaspora while regurgitating unsubstantiated allegations made by politically motivated individuals and groups, undermines her impartiality and neutrality. Sheila Keetharuth also chose to meet with officials in Djibouti and Ethiopia, the two nations behind the Human Rights Resolution on Eritrea, and conducted her interviews in both countries with persons who presented themselves as “Eritrean refugees and asylum seekers”. Her report does not reflect any effort on her part to verify their true identities, motives and state of mind. Most egregiously, she ignored the calls made to her by thousands of Eritreans through their representative organizations. Needless to say, their input, could have provided the balance, objectivity and impartiality that is sorely lacking in her methodology and compilations. The UN Rapporteur’s previous reports on Eritrea contain exaggerated, politically motivated, and unsubstantiated allegations based on information from disgruntled individuals and puppet groups whose obvious primary motive is to destabilize the country and foster political and social turmoil among the population. Her public and repeated associations with these groups also bring to question her ability to separate her personal involvement in the Eritrean political space and the campaign against the State of Eritrea, from that of her mandate as a UN Rapporteur. Sheila Keetharuth’s past reports contained insulting and unfounded allegations. Obviously, she does not know and has not visited the well mined border between Eritrea and Ethiopia. If children are being taken across the border, then it must be done by organized traffickers with the protection of and collaboration of the Ethiopian government, the Red Cross and UNHCR, on the other side of the border. How else can one imagine these children crossing such a dangerous militarized border? Rather than politicizing such a tragic issue, one would expect her to show concern for the security, safety and protection of such vulnerable groups and seek immediate intervention to stop human trafficking. Instead of shedding crocodile tears from Addis, she should call on the regime in Ethiopia to respect the rights of children and stop using them to advance its warped agendas. Another deliberate and distorted presentation on Eritrea that Sheila Keetharuth, someone who has never visited Eritrea writes about is the issue of “militarization of higher education institutions” in Eritrea, a regurgitation of the prevailing narrative on Eritrea produced by Ethiopia and its handlers, a transparent ploy designed to undermine Eritrea’s educational system. First of all, it is categorically false. These distortions are part of a concerted effort designed to denigrate Eritrea’s higher educational system which continues to grow and provide unprecedented access and produce thousands of graduates. This forward looking strategy is making a significant contribution towards the growth of intellectual capital of the young nation. Many visiting scholars from the diaspora who have been actively involved with the system as instructors and trainers can attest to this fact. Sheila Keetharuth in her past reports presented the fabricated issue of the Kunama and Afar ethnic groups in Eritrea and claims that they are being discriminated against and marginalized. With such preposterous assertions, she fell right into the political trap set for her by Ethiopia and its handlers. Both of these ethnic groups are being used by Ethiopia to advance its dual dreams-of getting access to the sea using the Afars, and reverse the final and binding decisions of the Eritrea Ethiopia Boundary Commission (EEBC) using the Kunama. The latter are inhabitants of Badme, the casus belli for the “Eritrea Ethiopia border conflict”, and was unequivocally deemed to be sovereign Eritrean territory by the Border Commission. 10. Sheila Keetharuth’s reports also regurgitate unsubstantiated allegations about the status of women in Eritrea by vilifying the Government of Eritrea’s efforts to improve the lives of the women of Eritrea. The contribution of the women of Eritrea to the struggle for independence is a matter of record and source of great pride for the women of Africa in general and Eritrean women in particular. Eritrea has outlawed harmful traditional practices such as FGM, reduced childhood and maternal mortality by improving access and delivery of health care for women. The gains made in literacy and education, and the overall advancement in the economic, political and social status of the women in Eritrea and the commendable contributions they are making to the welfare of Eritrean society everywhere is not mentioned in her reports. Repeated calls by Eritrea upon her to be neutral, independent and impartial in undertaking her duty have been ignored. The time is overdue to redress Eritrea and its citizens, who have been betrayed and victimized for over 6 decades in order to advance geopolitical interests of various powers in the region. 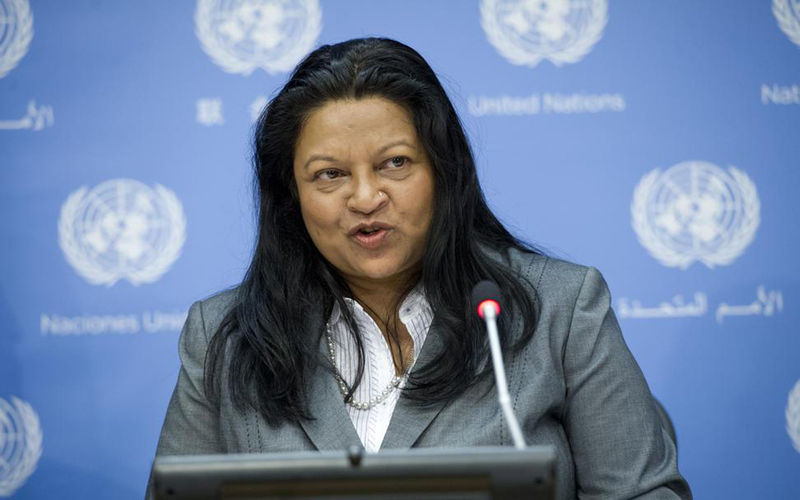 The UN Committees should play a role in righting the wrongs and not contribute further to the anti-Eritrea campaign that resulted in the inappropriate and unwarranted appointment of the Rapporteur and now the Commission of Inquiry (COI) of which she is a part. Any report produced by the COI will have been tainted by the Rapporteur and her long held anti-Eritrea stance. The ideal of the United Nations Charter, the sovereign equality of nations, big and small, powerful or weak, must be respected and upheld. No country has the right to intervene in the internal affairs of another and using the pretext of “protection of human rights” by the Rapporteur to intervene in the internal affairs of Eritrea and its people, its policies is a violation of that Charter. Eritrea is working with the UN Human Rights Council through the Universal Periodic Report (UPR) and the politically motivated appointment of the Rapporteur remains a diversionary tactic introduced to cover up Ethiopia’s violations of international law and the continued occupation of sovereign Eritrean territories. The UN System should not be used to advance the foreign policy agendas of Ethiopia and its handlers. This entry was posted in Uncategorized and tagged Africa, African Union, Commission of Inquiry, Eritrea, Eritrea Ethiopia, Eritrea-Ethiopia Boundary Commission, Eritrean community, Eritrean Women, Ethiopia, Human Rights, Mussie Zerai, United Nations Human Rights Council. Bookmark the permalink.